I’m doing a card-by-card study of the Dark Mansion Tarot. Read the original post here! When I discovered that the Dark Mansion Tarot didn’t come with a guidebook (not that it needed one) I took it as a chance to do a card-by-card study and revel in my own thoughts and interpretations of these cards. You can view the rest of the posts here. 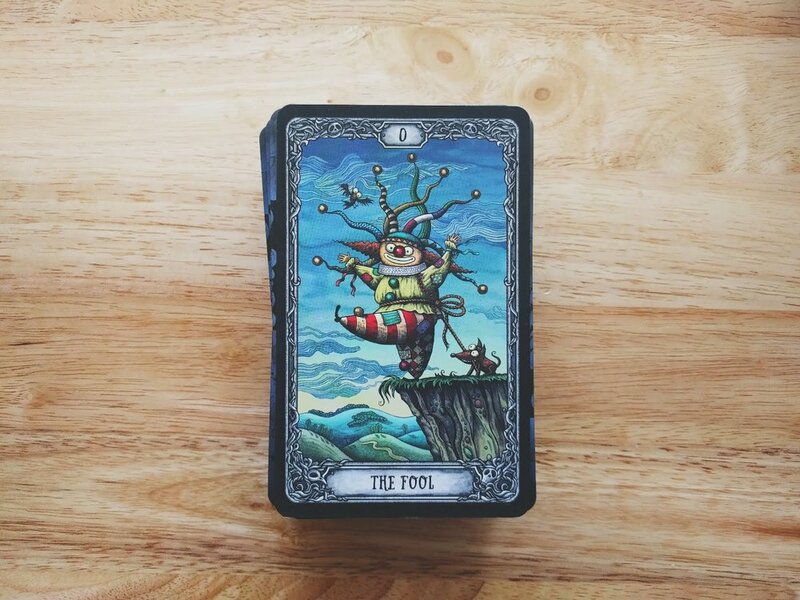 While I’m not a fan of clowns in most tarot decks, I do however, love the representation being used for the Fool. It fits and it works! Here we have quite a happy clown sporting full clown attire, which looks to be handmade and in total Fool fashion, carelessly about to step right off the cliff. This imagery is very close to most RWS depictions of the Fool. Their hat is very sporadic and branch like, I like to think of it as a representation of how they think and act, scattered but eager. Each “tentacle” on the hat is a different pattern. These patterns make me think that they could embody the different lessons the Fool learns on their journey. The dog holding on firmly to the rope tied at that Fools waist doesn’t seem like it will be doing much if and when the Fool steps off, it’s tied in a bow and could untie easily once weight is added. Maybe this Fool isn’t about to step off like they appear… maybe they are just being bold and want to strike a pose to show just how brave they really are. Who knows, they could be muttering “hurry and take my damn picture already!” under their breath. Down below the cliff illustrates rolling hills and a curving path. I feel like the path is a perfect representation of the Fool’s journey through the tarot, always turning. It veers over a hill and it looks to be unknown as to where it continues on or ends. For me, this card represents childlike exploration and full blown excitement for the road ahead, wherever that may be. It’s a free spirit stepping out into the light of potential. Since I don’t read reversals, I tend to look at all facets of a card. This Fool can bring about a feeling of being reckless, especially if you’re not paying much attention to your surroundings and are caught up in lala land... or trying to take a really dangerous selfie! It’s a good reminder to put thought to where you are going so that you don’t fall trap to an unexpected tumble down the wrong path. In general though, this card is about putting your adult things aside and embracing some foolishness and laughter in your day. Don’t take yourself too serious, there is a time and place for that… step into your inner child.